Despite the fact that Whitesearch.com may be promoted as a useful search engine that will provide you with improved experience and better search results, it still falls into the category of apps that are ad-supported. It is none other than a browser hijacker that aims at profiting off of computer users. It changes browser settings, causes redirects, and more. Although it is not a malicious parasite, it certainly lowers your online security level by presenting you with unreliable data. 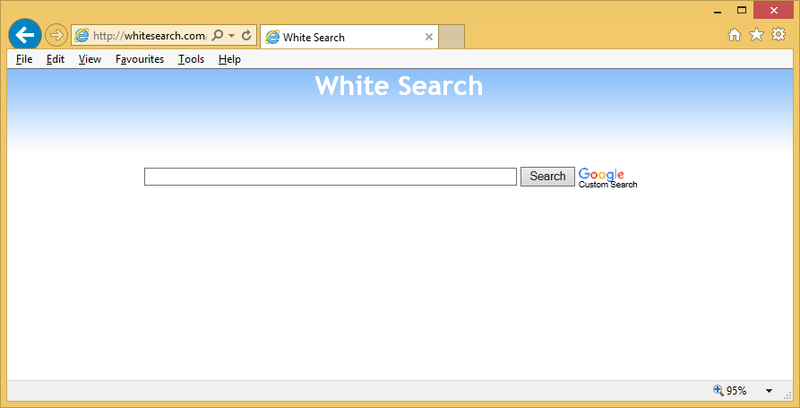 We suggest that you get rid of Whitesearch.com without hesitation. Before we go on to describe the hijacker’s symptoms, you should know how it ended up in your system. Browser hijackers use the bundling distribution method, which means that they travel in a bundle with other freeware. When you install free software, you add more than one program to your computer without even noticing it. You can avoid that by paying close attention to the setup of the freeware that you acquire. The most obvious modification associated with the hijacker is that it alters your browser settings replacing your home page and default search engine with Whitesearch.com. Visually, Whitesearch.com looks a lot like any other legitimate search page. It contains a search box, some links to popular domains (like Facebook, YouTube, Amazon, Gmail, etc. ), and links to the most visited websites. If that were all the hijacker did, you could consider leaving it alone, however, the settings modification is not the only action that it takes. In addition to a new home page and a search engine that will bring you sponsored results, you will also encounter adverts on other sites that you visit. The hijacker employs the pay-per-click system, so it makes money each time you click on the ads that it shows you. Unfortunately, these ads are not monitored by anyone, meaning that they cannot be trusted. You could be rerouted to unsafe domains with various scams as a result of interacting with the advertisements. There is no good reason to put your PC in such danger, especially when there is nothing beneficial about the so-called search tool. The sooner you terminate Whitesearch.com, the sooner you will go back to surfing the Web without unnecessary interruptions. Two options you can choose from include manual and automatic Whitesearch.com removal. You can delete Whitesearch.com manually by uninstalling its related application from your computer and fixing the modified settings in your browsers. Instructions presented in the manual Whitesearch.com removal guide below can assist you with that. The more effective solution, however, is to implement an anti-malware utility and clean your system from all potential threats including the hijacker. If you acquire the security software from our site, it will scan your PC, detect all dangerous components, and eliminate Whitesearch.com with them. It will also keep you safe online by protecting you from various online parasites.